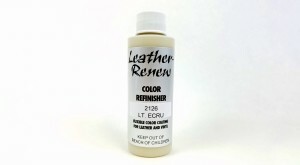 Our leather dye is water based and is available in hundreds of automobile colors. It offers a tough, durable, natural look and feel, flexible coating for leather. All colors are satin finish. Visit your dealers parts department to find your vehicle color name and color code using your VIN# (vehicle identification number). Click on the color chart button to determine the correct color code and color name for your vehicle. If you are not sure of the correct color, please give us the year, make and model of your car so that we can assist in finding the correct color. ***These samples are an approximation of the actual color. Colors may vary due to monitor resolution and personal settings.